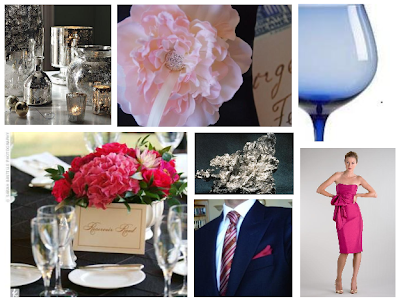 This February 14th, I'm shaking up tradition by steering clear of predictable red, pink and white. Instead I'm taking a look at some new color combos that are fun updates for your party palette! White on White - Nothing quite so clean and easy as this color combo! Set it off with some sparkling silver or gold. Set up a buffet for the gals with white cheese, white grapes, and white wine. 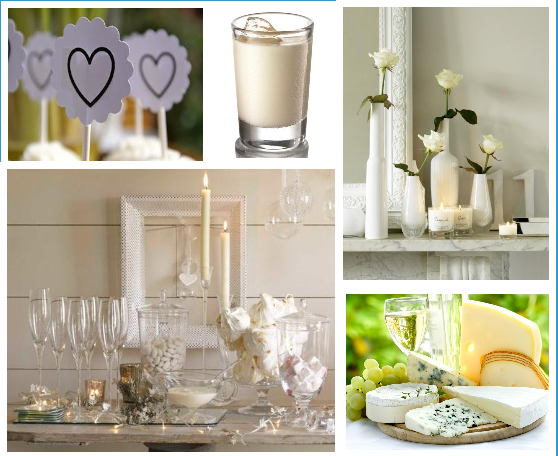 Or have a white dessert and drink party with White Russians and White Cosmos as your signature drinks. Purple and Grey - Fun and fresh, and a great way to brighten February. 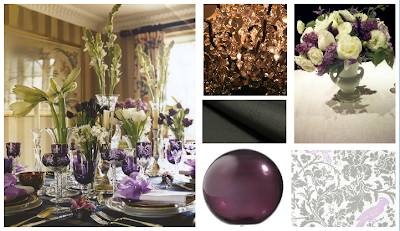 Set the table with grey patterned linens and purple glass. Have a Memory Lane family brunch or a mother/daughter All Dressed Up Tea Party (complete, of course, with dresses, pearls and hats). Navy and Fuschia - This is the color palate I'll be playing with this year. Navy offers a fabulous background for the pink to pop off of. It's fun and playful and will make a great setting for a Valentine's Day Fondue with Friends! !